Self-propelled industrial carry deck cranes are ideal for lifting applications requiring a compact, low-profile crane that will clear overhead obstructions and maneuver in tight spaces. Sterett carry deck cranes range in lifting capacity from 15 thru 22 tons. Carry deck cranes allow the load to be moved by the crane over short distances. These drivable units are easy to maneuver and are for job site use only. With a smaller 4-wheel frame and 360 degree rotating center boom, our carry deck cranes can hoist a load in a confined space, set it onto the deck space and easily move it to another location. 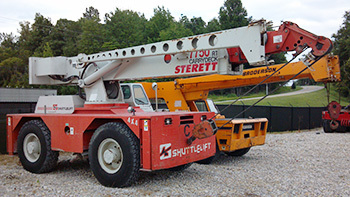 Sterett not only offers rugged and dependable carry deck cranes for rental, we also provide expert crane planning and management assistance. Our team is experienced in working on a vast array of projects at a wide range of locations. 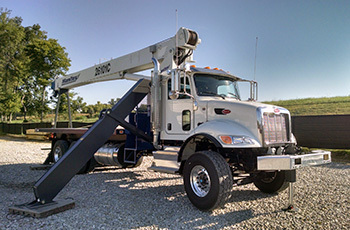 Our seasoned professionals will look the specifics of your job and provide you with the best crane rental package for the project. We are available to assist you in developing the most effective and efficient plan to bring your vision to reality. You can trust our experience to get the job done right. Contact us today to discuss your project. Sterett carry deck cranes range in lifting capacity from 15 thru 22 tons.